A developing bioeconomy and the need for alternate sources of energy are promoting a more intensive procurement and use of forest biomass. While it is a fact that increased biomass harvesting generates greater nutrient losses from forest ecosystems relative to stem-only harvesting, the use of nutrient budget approaches as a decision support tool in managing forests under intensive biomass removal is uncommon. This lack of use can be explained by several factors including: large uncertainties in predicting certain fluxes, the poor representation of nutrient dynamics following harvest in nutrient cycling models, the lack of representation of biological feedback, the lack of appropriate validation, and finally the lack of maps of specific soil properties that would be required to predict nutrient budgets over forest landscapes. This review documents the impact of intensive biomass extraction on nutrient cycling and discusses the gaps in knowledge and the uncertainties associated with nutrient budgets. 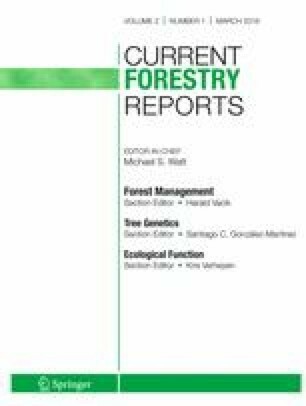 It identifies research and development issues that need to be resolved for making forest nutrient budgets more reliable and more useful to address the questions regarding the environmental sustainability of intensive biomass harvesting. During the last few decades, the demand for biomass feedstocks for bioenergy production has increased sharply; forest biomass1 not used by conventional wood product industries (e.g. sawtimber, pulp, fibreboard), such as logging residues (branches, tree tops), small trees or trees with defects, or non-commercial species is recognized as an important feedstock source [2, 3]. Also, coarse roots and stumps are in some regions considered as biomass feedstocks. A concern arising from the increased procurement of forest biomass is the potentially detrimental impacts that this additional harvest may have on soil productivity [4•]. Extracting more biomass from a given site increases nutrient losses out of the forest ecosystem. In addition, the biomass feedstock sources harvested for bioenergy production are generally richer in nutrients than wood fibre extracted for conventional wood products (i.e. tree boles) (Fig. 1). Consequently, as forest biomass is harvested more intensively, the nutrient export from the ecosystem per amount of biomass harvested also increases. An important question is therefore whether a given ecosystem can support this additional nutrient export. A theoretical nutrient budget is defined as the algebraic balance between nutrient inputs and outputs of an ecosystem, integrated over a specified time period : a forest management strategy that would yield a balanced nutrient budget (nutrient outputs ≤ inputs) would be considered as sustainable from the standpoint of soil fertility. An enhancement of harvest intensity where tree tops, branches and stumps are removed in addition to tree boles could shift the nutrient balance to a deficit [6•, 7, 8]. Harvest intensification coupled with acidic atmospheric deposition has promoted interest in the use of nutrient budgets to evaluate the sustainability of forest management practices [9, 10, 11]. Maintaining a nutrient balance is foundational to sustainable forestry, and there is an abundance of studies using nutrient budgets in the scientific literature. However, best management practices (BMPs), regulations and guidelines for sustainable forest biomass procurement rarely rely strictly on nutrient budgets [12, 13, 14, 15]. Rather, decision-making is most often based on empirically derived indicators of site sensitivity/suitability to intensive biomass removal, such as soil properties indicative of sites that may be of concern, for example, sites with wet or thin soils, steep slopes or low organic matter content [16, 17•]. Should nutrient budgets be more widely used to guide forest management activities involving biomass harvesting? In the following discussion, we will cover the implications of intensive biomass harvesting for site nutrient budgets, the caveats and knowledge gaps that may need to be addressed to make the nutrient budget approach more appropriate and useful to guide forest management. Most reviewed studies came from boreal and temperate biomes; however, the general conclusions should apply to other regions as well. What is the increase in extracted nutrients as a result of intensive biomass harvesting? Nutrient concentrations vary with tree species and tree parts. Biomass composed of small stems or branches or foliage will show greater nutrient concentrations than that of boles or of stumps. The analysis of the extensive database compiled in Paré et al. indicated that the greatest variability in nutrient concentrations of tree tissue rested between genera, whereas considering species did not further improve the precision of the estimates. Typical operations of logging residue recovery after clear-cut in the boreal and temperate biomes remove about 50 % of the original amount of logging residues present on site; however, it was found to vary from 4 to 89 % with the highest values found in Nordic countries due to better adapted equipment and trained workforce . Figure 2 illustrates the average increase in nutrient export (relative to stem-only harvesting) when 50 % of branches and foliage are removed in addition to tree boles for softwood and hardwood stands in Canada. When only branches are harvested (e.g. if logging residues are left to dry on site for one season, which allows foliage to shed and remain on site), the increase in loss of elements is around 30 % compared with the harvest for boles only, with phosphorus (P) losses being slightly higher at 40 %. When foliage is removed as well, the losses greatly increase. This is especially apparent for P and nitrogen (N) in softwood stands: harvesting half of the branch and foliage residues would more than double the extraction of N and P as compared with stem-only harvesting. A review of the impact of whole-tree harvesting studies [17•] indicated that reduced soil P availability following whole-tree harvesting compared with stem-only harvesting had been observed in a high proportion of studies. Impacts on soil N were less apparent; most significant reductions following residue removal were found only in the organic soil layers. Can nutrient inputs compensate for nutrient losses? Investigating nutrient balance is not a simple task as there is no universal standardized methodology for estimating nutrient inputs to the system. Sources of inputs vary according to elements: N comes mainly from the atmosphere, whereas P and base cations (i.e. calcium (Ca), magnesium (Mg), potassium (K)) are generally mainly supplied by mineral weathering. Most nutrient budgets suppose a steady state in nutrient input rates, i.e. static mass balances where nutrient fluxes are integrated over a specified time and are therefore constant over that period . Issues with this assumption are discussed in the following paragraphs. Nitrogen (N) is the nutrient that most often limits forest productivity [20, 21] as fertilization trials have revealed in the boreal and temperate regions [22, 23]. N inputs stimulate growth in a majority of forest ecosystems . It is therefore of crucial relevance to determine its balance in nutrient budgets. Atmospheric wet/dry depositions and biotic/abiotic fixation are the main sources of N inputs to the forest ecosystems . Several studies have indicated that in some regions, for example, southern Sweden or northeastern North America, N atmospheric depositions are generally sufficient to compensate for harvest-induced N losses even when including removal of harvest residues (Fig. 3) [25, 26, 27•]. However, in other regions, for example, northern Sweden, Finland or western North America, atmospheric N depositions would not be sufficient [25, 28, 29, 30, 31]. Furthermore, N inputs from precipitation have dropped significantly over the last few decades in several regions of Europe and northeastern North America. For its part, nitrogen fixation is often a neglected component of nutrient budgets. Apart from N-fixing plants, N fixation by free-living organisms is ubiquitous but spatial and temporal variability of the rates of this process is poorly documented. Because N fixation is an energy-consuming process, N-fixing organisms perform better in an environment where N is limited. This situation creates feedback in the N cycle that may be responsible for homeostasis in N availability , in which greater N availability reduces N fixation. The large reservoir of soil organic nitrogen, most of which is contained in organic or organo-mineral compounds that are recalcitrant to heterotrophic decomposition, constitutes another source of N because mycorrhizal fungi (fungi living in a symbiotic interaction with plant roots), especially ecto-mycorrhizae (EM), can mine this reservoir . Although such a reservoir is finite, it is large in comparison with ecosystem losses in harvested products (i.e. typically 10 to 20 times the amount in harvested wood products including biomass [26, 27•]). Feedback mechanisms between N and P plant demand and acquisition have been documented. For example, EM species with a high capacity to mine organic matter for N usually decline when availability of inorganic N increases . N fertilization or elevated N atmospheric deposition usually result in slow EM growth since the plant carbon allocation will be diverted away from belowground and will be used instead to incorporate inorganic N into amino acids to enhance aboveground shoot growth . Conversely, it has been shown that deficiency of N and/or P enhances belowground carbon allocation and EM growth . While acquisition of N is energy consuming and would involve a transfer of carbon and energy from the plant to its root symbionts, this process may nevertheless reduce the impact of increased N export through biomass removal on N availability in forest systems. These examples suggest that feedback loops exist within forest ecosystems and influence nutrient cycling: geochemical N inputs through N fixation and biogeochemical inputs through organic N mining can be enhanced by N deficiency. Greater nutrient inputs, as a result of nutrient deficiency induced by greater nutrient export in wood products could, at least partly, cancel an expected nutrient budget deficit such as illustrated in Fig. 4. However, these processes have yet to be taken into consideration in nutrient cycling models and budgets; a better quantification of these mechanisms is therefore needed. Also, if these mechanisms come into effect, while they may help to maintain plant nutrition, they would trigger an additional allocation of resources belowground, potentially to the detriment of forest productivity. Again, this has not been quantified. Johnson, Turner  also report cases of ‘occult’ N inputs into forest ecosystems, i.e. where apparent net increments of ecosystem N exceed known N inputs; authors attribute these occult N sources to poorly assessed/quantified inputs from dry deposition, non-symbiotic N fixation, and weathering of N from sedimentary rocks, highlighting the need for a better understanding of N processes and cycling. Contrary to N, atmospheric inputs of base cations (Ca, Mg, K) and P are generally small relative to losses in harvested products (Fig. 3) [26, 27•]. Mineral weathering plays an important role in their supply and is therefore an important input to their budget. Although several methods can be used to provide estimates of mineral weathering, they are fraught with uncertainties [38, 39] and a comparison of different methods shows that there can be large variability in weathering estimates. For example, Klaminder et al. and Lucas et al. found that variability in estimates, calculated for forested catchments in Sweden, was too high to determine whether harvest residue removal would shift the catchment nutrient budget to a deficit. A similar conclusion was reached by Johnson et al. in Ireland where the high uncertainties did not make it possible to distinguish the impact of harvest residue removal from conventional stem-only harvesting on the cation balance. In both studies, the increased nutrient export caused by residue removal was considerably smaller than the uncertainties associated with estimates of mineral weathering rates, preventing the use of the nutrient budget for decision-making. Two other issues further cast doubt on estimates of mineral weathering fluxes. Most methods are calibrated at the watershed scale and estimate mineral weathering rates over long time periods. Rates of soil mineral weathering are mostly derived from approaches that consider the soil as a homogeneous matrix in which weathering is a constant flux over time (driven by soil solution equilibrium reactions in the process-based approaches), and are calibrated at the watershed scale . They do not consider the fine-scale mining of weathering processes nor the fact that mineral weathering could be, to some extent, demand-driven. This debate is a controversial subject that is discussed in  and . Conversely, a growing body of literature suggests that EM as well as arbuscular mycorrhizal (AM) fungi  together with associated bacteria have the capacity to mine mineral surfaces for nutrients and that this capacity is enhanced by nutrient limitation; in that case, mineral weathering should be presented as a dynamic process. Plants have been found to invest more energy in their fungal symbionts under nutrient limitation, and the fungal transport of photosynthate-derived carbon towards patches of nutrient-rich mineral grains has been observed . Rock dissolution and tunnelling of mineral grains, notably of apatite, a Ca- and P-containing mineral, have been found to occur under both ectomycorrhizae and arbuscular mycorrhizae [48, 49, 50]. Fungal-mediated weathering of K- and Mg-bearing minerals such as biotite has also been observed [51, 52, 53]. This suggests positive feedback between plant nutrient requirements and mineral weathering rates. The importance of such a demand-driven process would considerably change the outcome of nutrient budgets. For example, Vadeboncoeur et al. [27•] reported that the amount of P removed in harvested products of New England forest stands on granitic bedrock was estimated at 20 kg ha−1. The soil supply in extractable P was estimated at values that varied between 38 and 194 kg ha−1; the P content found in apatite in the B soil horizon was estimated to range from 61 to 850 P kg ha−1 whereas the top 25 cm of the C horizon (in which mineral weathering is assumed to be minimal) was estimated to contain 0 to 2500 kg ha−1 P (a zero value is found for shallow soils with no C or no apatite). If these mineral P resources are considered to be potentially available to plant nutrition, this could lead to positive P budgets for forest stands for several harvest rotations, depending on the abundance of such minerals in the soil. As shown above, positive feedback has been documented between plant demand in N and P, and the mining of soil organic N and mineral apatite for P and Ca (Fig. 4) both at the fine scale  as well as the ecosystem scale. For example, Yanai et al. observed more Ca in exchangeable form in young fast-growing and nutrient-demanding stands than in old stands, while a steady-state nutrient weathering rate (as assumed in nutrient budgets) should have caused the opposite trend. Also, Bélanger et al. observed greater exchangeable Ca in soils of fast-growing tree provenances than in slow-growing ones. It is unclear whether deficiencies in other elements, such as K or Mg, would also trigger greater weathering at the mineral-root interface. Ericsson  documented impaired carbon loading into the phloem when Mg is in short supply: this could lead to negative feedback between plant nutrient demand and plant capacity to acquire nutrients, which would mean that the capacity of the forest ecosystem to reverse a Mg deficiency could be difficult and that fertilization could be required. Another aspect often neglected in nutrient budgets is the availability and cycling of nutrients contained in harvest residues. It is often assumed that all nutrients stocked in harvest residues and released upon decomposition and mineralization of residues will contribute to soil-available nutrient reserves and to plant nutrition. However, recovery rates (in terms of the amount of nutrients available in the soil-plant system, relative to the original amount contained in harvest residues) were found to be generally high for Ca and Mg (above 40 %), but low for K (0–15 %) , an element that easily leaches out of the soil profile as reported in Thiffault et al. [17•]. Another study  suggested that very acidic mineral soil layers, whose cation exchange sites are saturated with exchangeable aluminum (Al), would have a very limited capacity to capture and conserve base cations released from decomposing harvest residues: exchangeable Al is difficult to displace from exchange sites notably due to its high valence. On the other hand, soil layers with low concentrations of exchangeable Al, such as organic layers, can more easily acquire and conserve released base cations. Therefore, field studies following up on the fate of nutrients from harvest residues over time are suggesting that contrary to what is expected in static nutrient budgets, the capacity of the soil-plant system to retain nutrients that are released upon the decomposition and mineralization of harvest residues is not 100 % and largely depends on the nutrient, soil and vegetation conditions. This therefore implies that nutrient budgets of a forest system are more complex than a simple geochemical accounting of nutrient gains and losses. The capacity of the soil-plant system to retain and cycle nutrients may have a great influence on the actual benefits of maintaining residues on the site, perhaps more so than the actual amounts of nutrients leaving the system in harvested products. Figure 5 shows the theoretical pattern of nutrient immobilization in a growing stand. Immobilization is maximal at canopy closure, after which nutrient recycling in the tree and in the soil-tree systems becomes more efficient [58•]. Following harvesting, there is generally a flush of nutrients (the Assart effect ) due to a greater input of litter, a lower plant uptake and often a faster decomposition/mineralization of the litter and forest floor. This flush may, or may not, be in synchronicity with plant and soil immobilization rates, depending on the nutrient (Fig. 5). For example, the rapid flush of K leached out of harvest residues may quickly leave the system without accumulation in soil or plant pools (e.g. ) while the slower release of N  may provide better synchronicity and retention within the plant-soil system. The fact that residues are often not evenly distributed on the harvest area , but often concentrated in skidding roads or in piles across the cutblock, might also influence the capacity of the plant-soil system to efficiently recover their nutrient content. Static nutrient budgets therefore fail to encompass the specific dynamics of debris decomposition. Moreover, in terms of dynamics, Smolander et al. documented how the release of terpenes and phenolic compounds from harvest residues may stimulate soil C and N cycling by providing a source of C to microbial populations. An increase in enzymatic activities involved in N, C and P transformations has also been linked to the amount of harvest residues retained on site . In summary, the beneficial effect of maintaining slash for plant nutrition may be overestimated by nutrient budgets if they assumed that all nutrients retained in slash are contributing to the soil-available pool and if they ignore biological feedback mechanisms. As pointed out by Zetterberg et al. [65•], large nutrient depletions predicted by nutrient budgets have almost systematically failed to be observed in empirical, field-based studies. However, introducing these processes in modelling may be challenging. Despite these findings related to nutrient cycling, several studies have shown that the effect of harvest residues on tree productivity in the first years following harvest was mostly related to the physical effects of residues on the soil environment, and not to nutritional changes. For example, at a very early stage of stand development, the presence of residues on site may increase light and water availability for tree seedlings because of the inhibition of competing vegetation cover [66, 67, 68, 69, 70]. Soil water availability may also be affected through the sheltering effect of residues that limits evaporation but intercepts precipitation  especially when residues are not mixed into the soil by site preparation. Apart from competing vegetation and soil water, logging residues can affect planting microsites by decreasing soil temperature [70, 71, 72]; on sites with already short growing seasons, this can hamper seedling physiology and growth. Proe, Dutch  suggested that the impacts of residues on microclimate and competition control should be visible shortly after planting; when a stand approaches crown closure (e.g. 8–12 years after planting in the boreal climate), effects of removal of logging residues on soil and tree nutrition could become more apparent . However, 10 years after harvest and stand establishment, Smolander et al. found little correlation between the response to harvest residues of soil (chemical and biological) properties and tree growth. The authors suggested that some non-nutrient factor brought about by the residues, such as changes in soil physical conditions, was still driving the response of trees to residue retention, even 10 years after stand establishment. These results underline the fact that the actual response of the forest ecosystem to the presence/absence of residues may only be loosely related to the retention/export of nutrients caused by harvesting methods: forest biogeochemical cycling and tree productivity appear to be driven by more complex factors and interactions than simple nutrient inputs-outputs at least in the short-term window provided by experimentation (which admittedly has yet to cover a complete rotation). Nutrient outflow could still become the main driver of ecosystem functioning after one or several rotations. It is also interesting to note that removal of harvest residues at thinning has been found to have negative impacts on subsequent growth of the remaining trees ; the important retention of forest cover during thinning probably lessens any microclimatic effects that the maintenance of residues often have in clear-cuts, and nutrient availability might be the overriding driver of tree growth at the stage of the rotation when thinning occurs. Nevertheless, it would be important to correctly interpret the impact of biomass harvesting by taking into consideration non-nutritional effects on nutrient budget studies. Critical loads of acidity, which are budgets with inputs and outputs of acidity, have been successful at linking up science and policymaking for the control of atmospheric pollution and their potential deleterious effects on water and forest ecosystems. The reasons for this success are the fact that input-output calculations are intuitive and relatively easy to understand, they are easy to calculate, and the results from calculations could be readily translated into policies such as air pollution abatement strategies . Therefore, because increased biomass harvesting causes greater nutrient loss, a nutrient balance approach to determine conditions (site type and intensity of removal) where such practices would be environmentally sustainable or detrimental appears logical; it might be an interesting preliminary step in interfacing scientific assessment of sustainability of forest practices with policymaking. The concept of ecological rotation is a good summary of this idea . Moreover, nutrient budgets make it possible to predict nutrient balance at the end of one or several rotations, whereas most field studies on biomass harvesting in the boreal and temperate biomes have been in place for only a few decades and therefore only cover short- to medium-term effects [65•]. However, the nutrient budget approach has several important limitations as discussed here. In particular, it is prone to large uncertainties for several nutrient fluxes, it generally ignores ecosystem feedback mechanisms that are very common in natural forest systems, and it ignores key drivers of geochemical and biogeochemical cycling and tree productivity. Nutrient budgets may be more readily adapted to conditions of intensively managed short-rotation plantations that are closer to agricultural systems, in which nutrient inputs/outputs and cycling are somewhat simpler to assess. For example, nutrient budgets have provided a useful methodological template for nutrient management in coppice forests . However, nutrient budgets appear to be inadequate for capturing the complexity of most forest systems, especially long-rotation systems such as found in the boreal and temperate biomes. Furthermore, the nutrient budget approach has undergone very little validation. Validation is a prerequisite to the use of models to guide ecosystem management. Interestingly, one example of empirical field validation of predictions made by theoretical nutrient budgets has shown that contrary to budget predictions from Johnson et al. , leaching losses and uptake by regenerating vegetation did not deplete soil-exchangeable Ca pools within 15 years of harvesting of boles, branches and tree tops of mixed oak stands . Here, it may be pertinent to quote Aber  from his well-known note entitled “Why don’t we believe the models?”: “Perhaps the greatest dis-service ecologists can provide comes from allowing… unvalidated models to be used to predict the results of policy actions. It is equivalent to basing policy decisions on data we know to be seriously flawed. It also fosters the false impression that we know more than we do about the systems we study, which is then often in contradiction to what the experimental data suggest”. Given the large uncertainties of the nutrient budget approach, and the fact that it fundamentally lacks the dynamic aspects of soil-plant interactions, it appears prudent to build confidence with the empirical evidence related to biomass harvesting provided by sound experimental designs such as the North American Long-Term Soil Productivity (LTSP) project  and to promote the widespread use of monitoring [82, 83] as well as a better integration of models with observations as they become available. Nevertheless, as part of a scientific approach that includes modelling, empirical validation with field studies and further improvement of model assumptions, nutrient budget models remain a useful tool to identify knowns and unknowns in the biogeochemistry of forest ecosystems. In the following text, the term “biomass” will be used in reference to the biomass that is harvested in addition to the conventional harvest of boles. The Intergovernmental Panel on Climate Change uses this term in a much broader sense: “Organic material both aboveground and belowground, and both living and dead, e.g. trees, crops, grasses, tree litter, roots etc. Biomass includes the pool definition for above-and below-ground biomass” . In forestry, the term is context dependent as un-used tree species, woody parts with a smaller diameter than what is considered commercial, as well as other tree parts such as stumps vary in definition depending on forest type, uses and regulations. We thank Dr Jérôme Laganière for his helpful comments and Pamela Cheers for language editing. We thank two anonymous reviewers for their comments. Adamczyk B, Adamczyk S, Kukkola M, Tamminen P, Smolander A. Logging residue harvest may decrease enzymatic activity of boreal forest soils. Soil Biol Biochem. 2015;82:74-80. doi: 10.1016/j.soilbio.2014.12.017.